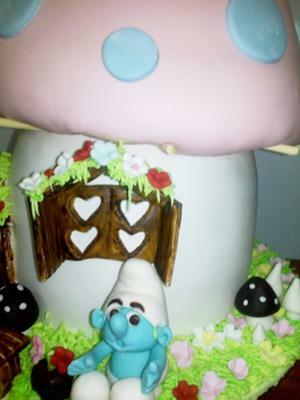 To make this Smurf house cake, I baked 4 layers of cake for the first part of the cake, filled with butter cream and strawberry jam, covered with butter cream and covered with white fondant. Next, I cut out the door and the window shapes, and glued them to the first part of the cake. Next, I inserted 4 dowels to support the cake and to be able to hold the upper part without flatening it. The second part of the cake was also made of 3 layers of cake filled, and frosted with butter cream. I sculpted it to match the shape of the upper part of the mushroom and covered it with butter cream, then with pink fondant. 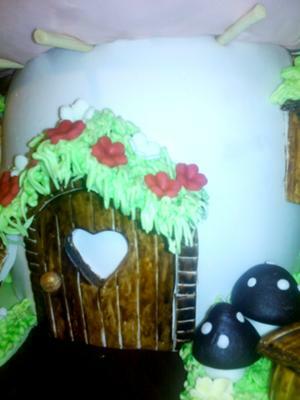 I applied the second part to the first part and fixed with butter cream, then made all the details showing in the cake like the grass, flower pots, small mushrooms, the stool, the flowers and of course the smurf figures. It ended up wonderful. Hope you like it. THIS CAKE IS SO DARLING AND SO WELL DECORATED, I WOULD NOT WANT TO EVEN CUT IT LOL, WHAT A GREAT JOB, VERY NEAT AND CLEAN. I admire you, please keep up the good work. Any child would remember this birthday cake for a long time to come. It's beautiful and I bet it's tasty too. Well done! It's look very nice, I want to have house like this :) all the best. Excellent job!! It is a delicious piece of art! !